It’s an exclusive! 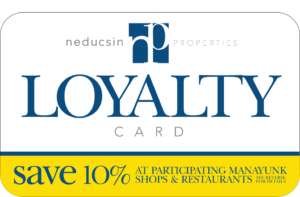 All Neducsin Property Tenants and their employees save 10% by using the NP Loyalty card at all participating businesses listed below. Clothing and jewelry only, Discount does not apply to handbags. Don’t delay use your card and show your support in our special community. Follow us for new additions and special information.